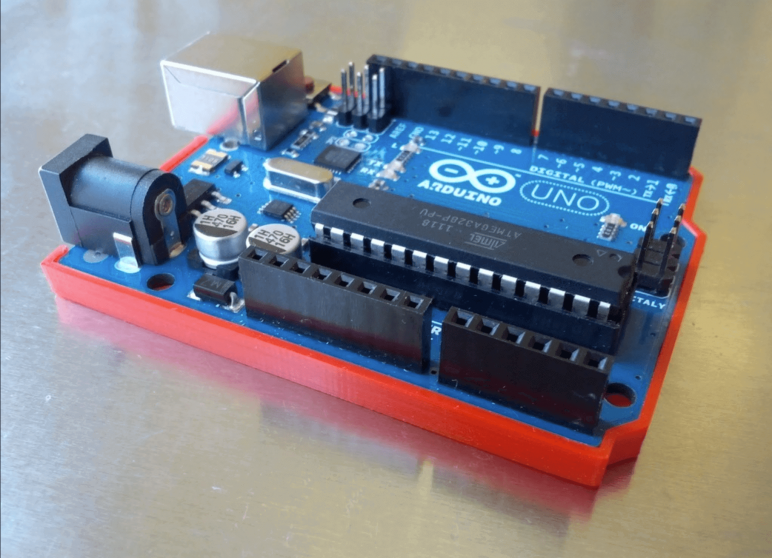 The Arduino is quite a marvel: It is small, versatile, hackable and surprisingly sturdy. As the microcomputer is often used in labs or mobile environments, it’s best to put it in a case so that it doesn’t shorten out on conductive surfaces or pins bend on contact with the environment. Simply put: Better safe than sorry. 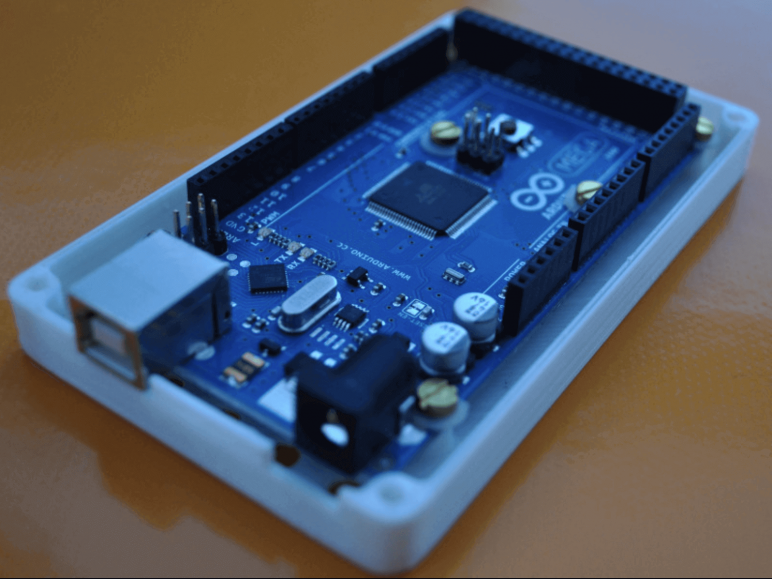 We’ve browsed through the main 3D printing repositories for great Arduino cases which are easy to 3D print. Here are the best. All the designs you see here are free for downloading. If you like a case but have no 3D printer available, you can have the parts printed by 3D printing services.. To get the best price, you can use All3DP’s 3D Printing Price Comparison Service. Who made this 3D printed Arduino case? 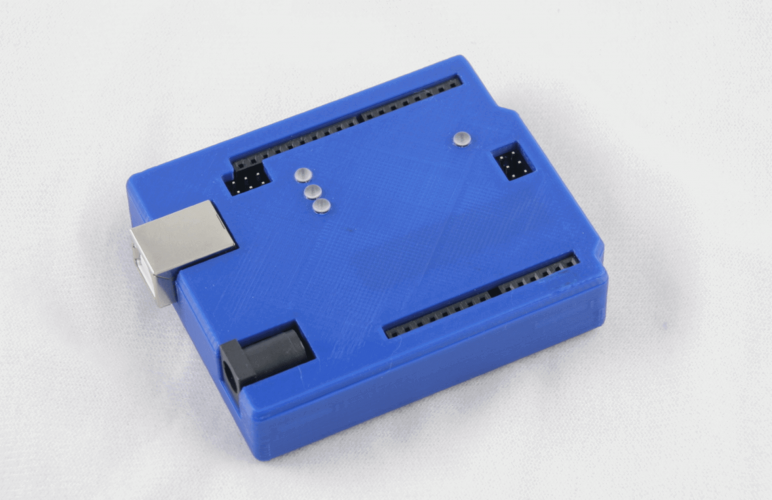 This 3D printable Arduino case was made by Eric Chu, an industrial design student. It looks a bit like an iPhone bumper and mainly covers the sides and the bottom of the board. The bumper press fits onto the Uno and Leonardo models. Recessed grooves located under where the pins sit, allow the back of the board to sit flat in the bumper. There’s a second version with mounting holes. Is it difficult to make? It’s a very easy print that should be finished in half an hour. Where can I download it? At Thingiverse. Who made this 3D printed Arduino case? Zygmunt Wojcik in the UK came up with a great and simple design for the Uno / Leonardo. It consists of a base, a top and – quite handy – a reset button. Make sure you get the right printing files, there are different versions for the Uno / Leonardo. 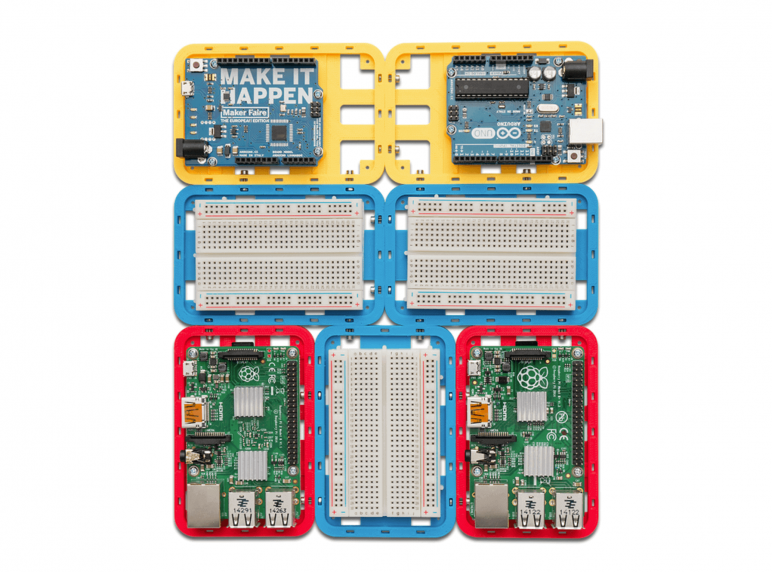 There’s a third, slim Arduino case available which you should check out. Is it difficult to make? Not at all. It is designed to print without support, there are no bridges as well. Shouldn’t take longer than 1.5 hours to print. 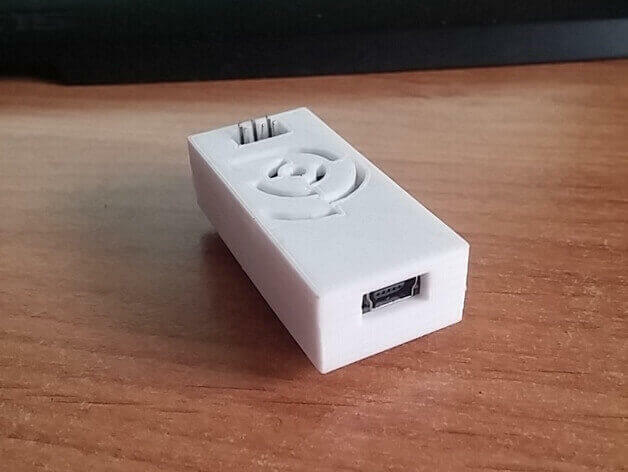 Who made this 3D printed Arduino case? Jason Welsh, an artist in the digital media and 3D print design, came up with an ingenious idea. This is more than a mere Arduino case – it’s a “lab in a box”. It holds the microcomputer with a breadboard. It also comes with two drawers that you can store resistors/caps in. When the breadboard and drawer are gone, the board and shield can be stored. The lid protects whatever you have already setup on the proto-board. Honestly, this is one of the coolest 3D printed Arduino cases we’ve seen so far. Is it difficult to make? Yes, there’s some assembly required. You’ll find some helpful instructions on YouTube. Where can I download it? You get the files for this Arduino case on Thingiverse. Who made this 3D printed Arduino case? Sebastian Liebhart designed this folding Arduino case. Unlike Jason Welsh’s folding Lab it has no storage for parts and you can’t keep a shield on the computer. It uses magnets to keep it closed while carrying. Is it difficult to make? Medium difficulty. Consists of six 3D printable parts, some assembly required. Who made this 3D printed Arduino case? Engineer Scott Shumate made this Arduino case. It‘s a snug fitting case for the Uno model with screw board mounts and a snap top. Shields may be installed over the top of the case. There are four holes on the top to view the four LEDs on the board. Is it difficult to make? No, any beginner with some tinkering skill can build it. Where can I download it? You get the free files at Thingiverse. Who made this 3D printed Arduino case? 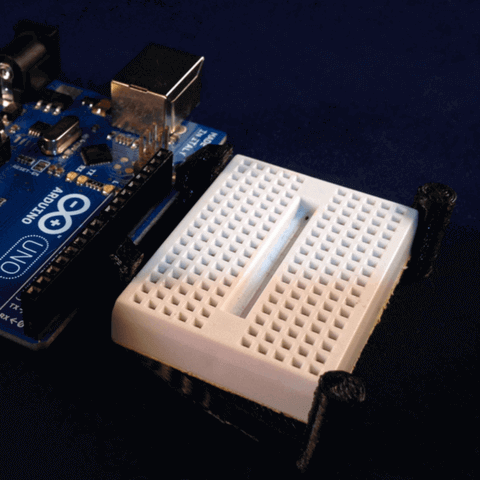 This Arduino Nano case was made available by Brian Spradlin (image: Lee Winter). It fits the Nano V3 model. The bottom half has two rows for the bottom pins. The top design allows access to the reset pin through the center hole and visibility for the four onboard LEDs. The two halves fit together with simple friction and are held together with the help of the natural ridged pattern from fused filament printing. Is it difficult to make? Not at all. The two-part design should be printed and ready in an hour latest. Where can I download it? Thingiverse. Who made this 3D printed Arduino case? 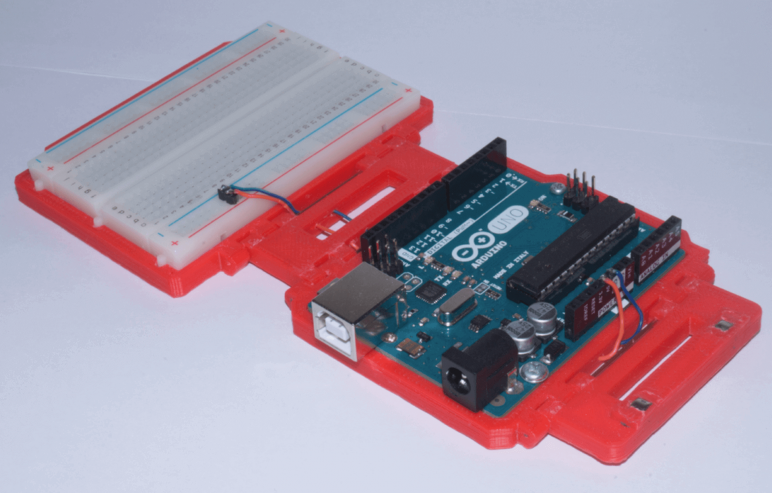 Patrick Monnier designed this Arduino case for the Arduino Mega R3 and RAMPS 1.4. Is it difficult to make? It’s neither a complicated print or built. Where can I download it? 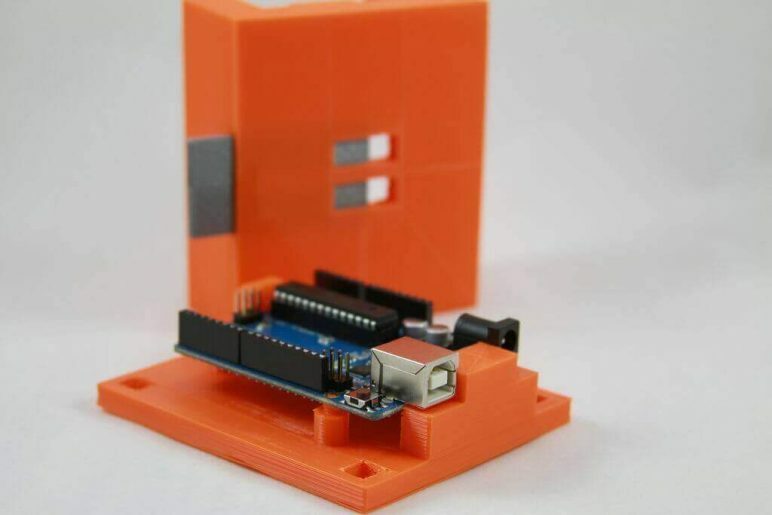 You’ll get the files for this Arduino case at Thingiverse. Who made this 3D printed Arduino case? 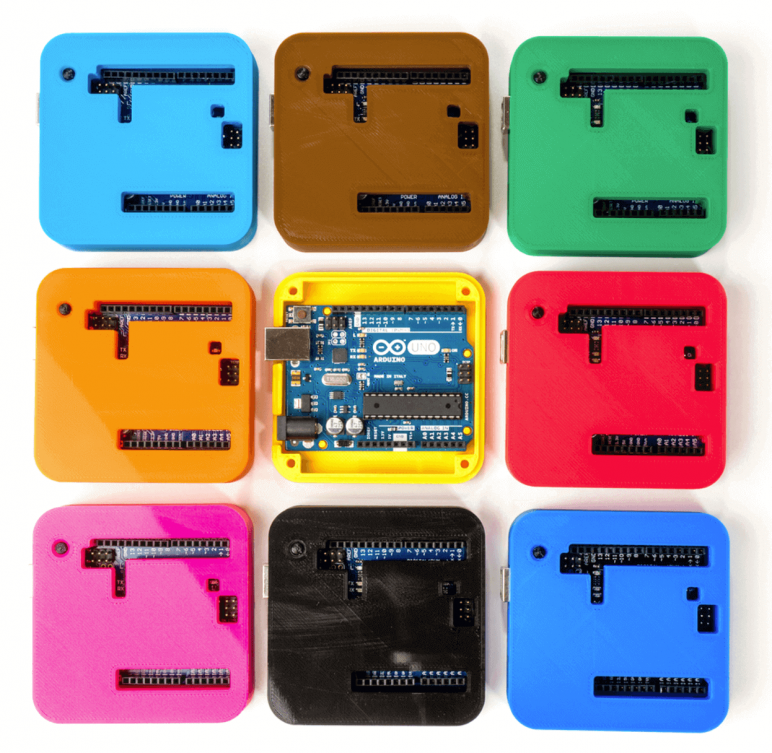 Maker Icare in France designed this Arduino case. 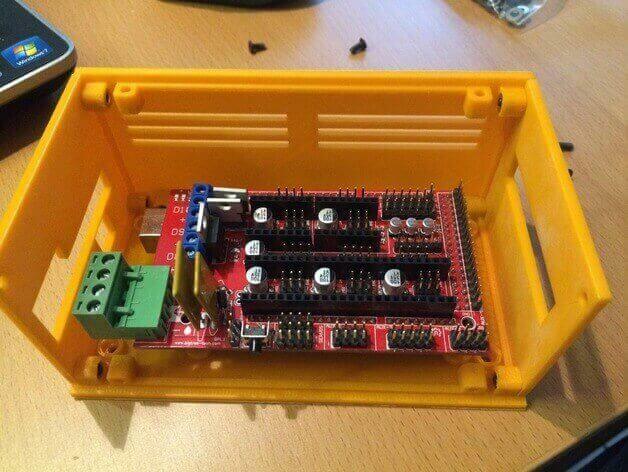 He also designed alternative case for the Arduino Mega R3. Is it difficult to make? No, it should be an easy 3D print and assembly. All you need are some screws. Is it difficult to make? It looks complicated, but it’s actually an easy print. Who made this 3D printed Arduino case? 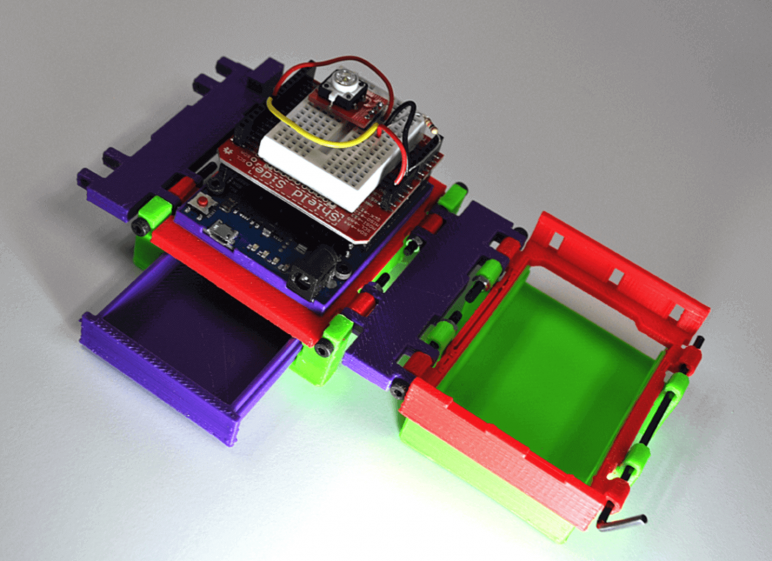 Jigsawnz’ Arduino Uno and Breadboard holder is a neat little design. This caddy holds an Uno (or a dusty old Duemilanove, if you’ve still got one of those kicking around the toolbox) and your standard 4.5cm x 3cm breadboards. Is it difficult to make? No. Where can I download it? Free at Cults3D. Who made this 3D printed Arduino case? This 3d printed Arduino case from jwags55 is designed to be used with Adafruit’s LCD shield kit with buttons and a Carlon electrical box. There are two versions available. One STL file has text on the buttons, the other one doesn’t. Is it difficult to make? No. You need some additional M3 screws. Where can I download it? Free at Thingiverse. Who made this 3D printed Arduino case? Instructable member Megaduty made a simple and sturdy protection box for the R3 version plate, including an Ethernet shield R3 box top addition. 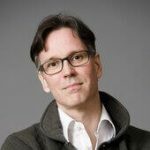 “I’ve been pushing out multiple Arduino Uno builds and needed a secure plate and box combo that could keep assets safe during a fall or tumble and would allow for under plate wire runs. I got tired of ordering and waiting for ~$10 boxes to get to me in the mail and then having to hack them up so I made my own dialed in unit for ~$0.10 each”, he stated. Is it difficult to make? Not at all. There are also detailed instructions and versions for older models. Where can I download it? You get the files for this Arduino case at Instructables. 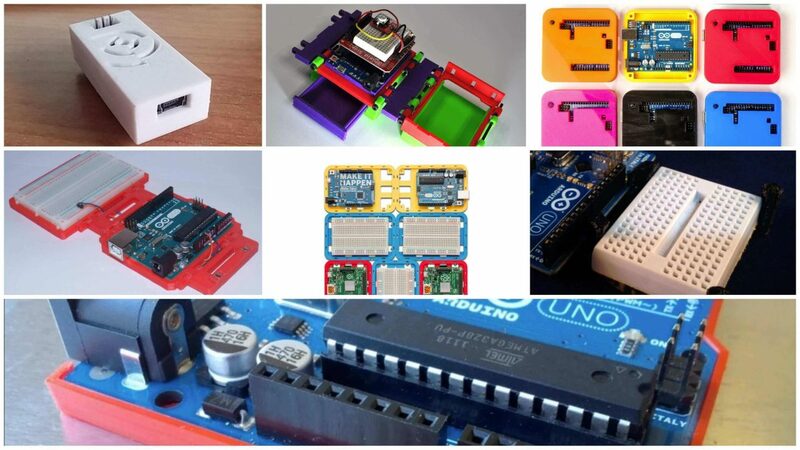 License: The text of "12 Awesome Arduino Cases to 3D Print" by All3DP is licensed under a Creative Commons Attribution 4.0 International License.